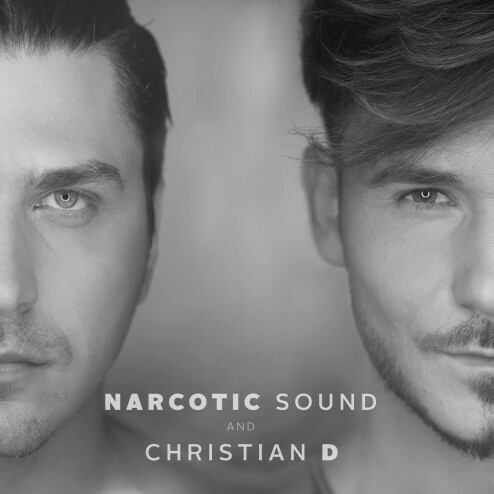 Narcotic Sound and Christian D.
Narcotic Sound and Christian D. is one of the most successful dance-house projects on the Romanian music scene. The name Narcotic Sound characterizes very well what they want to convey through music: energy, a fresh sound with dynamic voices and also warm. The vocal segment of the project is Cristian Dumitrescu, alias Christian D., one of the members in the former dance band Refflex. ‘Suena‘ and ‘Hope‘ are the songs that prepared the time when Mamasita climbed the podium. Ever since the release of ‘Mamasita’, they knew it would be a real success. The lyrics in Portuguese are a perfect fit to the energetic rhythms and the fine Parisian influences and generate a euphoric mood – Feel una MAMASITA Paris-Latino! The expectations have been confirmed by the positions occupied in the music charts in Romania and abroad. Besides the countries where ‘Mamasita’ was licensed (Russia + the CIS Countries, Spain, Ukraine, Bulgaria, Israel, Italy, Sweden, Denmark, Norway, Finland and Island), the song is also one of the most played projects both on the radio and on TV. ‘Mamasita’ succeeded in gathering on YouTube more than 10 million views. Narcotic Sound and Christian D. – Dança Bonito: When Media Forest says that it is the hit of the summer in 2010 Narcotic Sound goes on and releases hit after hit. After the incredible national and international success with the super hit ‘Mamasita’, Narcotic Sound and Christian D. release a new single called ‘Dança Bonito‘, which perfectly defines the narcotic style, being a dance song with Latino influences, combining the dynamic sound with the refined voice. The song could be heard for the first time on July 10th, 2010 at the Romanian Music Awards Gala (Craiova), an event where the boys put on quite a show. ‘Poesia de Amor‘, the third single signed by Narcotic Creation Studio, comes with a new dance sound and is meant to be the hottest song of the summer. Without any doubt, Narcotic Sound is one of the most successful Romanian dance projects. ‘Mamasita‘ and ‘Dança Bonito‘ are the songs that put Marius and Christian D. on the highest positions in the music charts both inside and outside the country. This time they want to win us over with a new formula: seduction and innocence or ‘Poesia de Amor’. Summer of 2012 – Narcotic Sound and Christian D. are inviting us in the Narcotic Village, in the video of their new single “Vai”. 2013, Narcotic Sound and Christian D released the song “Tara Song”, another dance track, with latino flavour and trumpet beats. End of 2013 summer means “Bye Bye” – their first song with English lyrics and their first video without the presence of the two boys. 2014 – another year, another premiere. They released “Labirint de sentimente”, first song with Romanian lyrics. July 2014 – its all about “Unidos pela musica” – a dance/deep house song with an amazing message, about friendship and music. February 2015 – In the month of love, Narcotic Sound and Christian D. made a simple and sincere song – “Te iubesc” (I love you). Summer of 2015 – came “Ale”, first featuring with Andreea Banica, and another collaboration for Narcotic Sound and Christian D. with a female artist in a while. “Ale” means energy, fresh sound, positive vibes and sensual moves.